Just wanted to share the latest addition to my small collection. It needs to be cleaned a little bit, but I love the color of the flowers. Last edited by plantomaniac08 on Wed Dec 07, 2011 6:18 pm, edited 1 time in total. Oh, lovely! I have several. They're probably my favorite indoor plant. If only I had the room! Do you have any photos of your holiday cacti? I'd love to see them. I have posted several pics of them here in the past couple of years. Why not try using the Search the Forum function? If you type holiday cacti (or cactus) in the search box, and then my name under "author", you might find them. If not, post and let me know. I'll find them in my photobucket acct and repost them. I'm not as lazy as this post makes me seem, but I was just lying down for a nap. I didn't sleep at all last night, and I've had company all day. I'm worn out. I found a few photos of your thanksgiving cacti, one of which looks peach and a couple pictures of one that looks to be red; both cacti were very nice looking. Thanks for the information on searching for the photos. I'd love to have a peach one myself, but the white one I recently purchased is the only one I've found that wasn't a common color (for the stores around here). I always seem to find red or fuschia. How many do you have in total? How old is your "oldest" thanksgiving cactus? I hope you don't mind all the questions, it's nice to have others to talk to about plants. Hubby doesn't mind me talking to him about them but he has different hobbies hehe. I think my oldest ones are around 3 or 4 years old. I have a total of about 7, maybe 8. I trade starts with people I meet, buy small plants at the store, grow them to 10 or 12 inch pot size, then often give them to friends for gifts during the holiday season, i.e. Thanksgiving through Easter. All the while I'm growing them to size, though, I'm taking leaves to start new ones. I usually have at least a couple of each color, in various sizes, at any given time. I just bought two lovely "Christmas Cactus" at Lowes. One is fuchsia colored the other red-orange. The leaves and over all plant look just like your Thanksgiving cactus, are they the same, just different names? Also, I usually kill them off, can you offer care instructions for growing them at home, in less than greenhouse conditions? Thanks. Ozark Lady, I was reading online sometimes Thanksgiving Cactus are labeled "Christmas Cactus" because sometimes they are sold around Christmas time; a marketing ploy I guess? Below is a link that will show you a picture of the difference between a Thanksgiving Cactus and a Christmas cactus in regard to their leaves. The first set of leaves in the picture are Thanksgiving Cactus leaves, second set are Christmas Cactus leaves. The Thanksgiving Cactus has more pointy leaves whereas the Christmas Cactus has more rounded leaves. I also read online that the flowers look different. The only difference I can seem to find in the flowers is that the Thanksgiving cactus flower petals seem to "pull back" whereas the Christmas Cactus flowers don't. As to the Thanksgiving Cactus' care, I am not an expert myself, so I would say to look online, just type in "Thanksgiving Cactus care," or see if any other fellow members posts (I wish I could be more helpful but I don't have enough experience growing one of these to "advise" anyone else). I just remember reading online that perhaps the #1 thing that can kill them is overwatering. I did read they like to go outside in spring after the last frost and stay in a shady area with no direct sunlight until it gets too cold for them to be outside anymore. Other than that, I'm about as green as they come! That's a good idea, growing them as future gifts. Maybe that's something I'll do when I have the space and best growing requirements for them. Did you compare the leaves of yours that you posted to what you sent the link to? Yours has pointy leaves, so does mine, but not nearly as many points on the red one as on the fuchsia, and alot less than in the link. But, definitely not rounded like the link. I normally kill plants by underwatering, not overwatering. When I get these the leaves normally just shrivel and fall off. So, I buy them, never expecting them to survive more than a month. I did compare my Thanksgiving cactus to the link; most of the segments (leaves) on mine are pretty pointy. I read online the other day that while some segments may appear less "pointy" than others, they are still Thanksgiving cacti (Sorry I didn't save the link to this statement). I think that is just the variation that can occur between plants, as in nature, no two are exactly identical to each other (even if they are the same plants). If your cacti are currently blooming, did you compare your flowers to the flower links? The Christmas cactus flower looks pretty different than the Thanksgiving cactus flower, that's also a way to figure out which one you have. Hmm... I wish I knew what to say about the leaves shriveling and falling off, that does sound like underwatering to me. I'm not sure if that is what happened to your past cacti or not (still learning how to care for these myself), what kind of lighting did your provide them? How often did you water them? I read some more online today about the Thanksgiving cacti. After they stop blooming, you should water them infrequently (don't allow them to completely dry out, but allow the soil to dry a good bit before watering again). It is important to not keep them too moist after they flower as I read this is their "resting" period. Once the first growth appears (I'm guessing this might not occur until after you stick them outside in March or after the last frost, whichever comes first), that's when you water them as soon as the soil dries out a little bit (they get watered more during this time period than they do after flowering). I hope this helps and I hope this post wasn't too long to read! Ozark Lady, Welcome back!!! !........You and I seem to have the same problem, I can't keep them alive either!!!! Don't know why? I think I'm must be a christmas cactus plant killer! My little cuttings I got in the mail lived for quite awhile, then all slowly turned toes and died. Think I will just get a flowering plant every year, and forget trying to grow them. My experience is that any of the holiday cacti can be made to flower at Thanksgiving, Christmas, and/or Easter, depending on how the temperature and hours of darkness are manipulated. I keep my cacti in an unused bedroom, and can adjust the temperature and hours of darkness anyway I like (except during the summer months, of course). I don't have time to find it right now, but I have posted detailed instructions on the methods I use to coax my holiday cacti into bloom. The search function should turn it up for you, if you're interested. I begin the temp/darkness control with my holiday cacti at the beginning of September. They bloom about mid November, shortly before Thanksgiving. When the buds are about to open, I bring them out into my living room, so my friends and I can enjoy them. The cacti drop their flowers around early December, so I move them back into the unused bedroom, and by Christmas, they're in bloom again. Sometime in January, they drop those flowers, so back to the bedroom they go, and they generally bloom again in March. They flower for me through April, unless I get busy and neglect them. I haven't looked it up for years, but I have a vague memory that the original Christmas cactus was Schlumbergia, and the Thanksgiving cactus, which came on the scene later, was Zygocactus. I understand that the two species have been so extensively hybridized -- which may have resulted in the Easter cactus -- that it's difficult to tell exactly which species a plant might be. Apparently, Schlumbergia and Zygocactus have different numbers of "points" on the leaves, or one of the two has more rounded "points" than the other. (Honestly, I don't remember anymore ... ) I also seem to remember reading that true Schlumbergia are not often found these days. I don't believe they are considered rare or valuable, just not real common. I expect that's because of the extensive hybridizing to produce different colors of flowers. 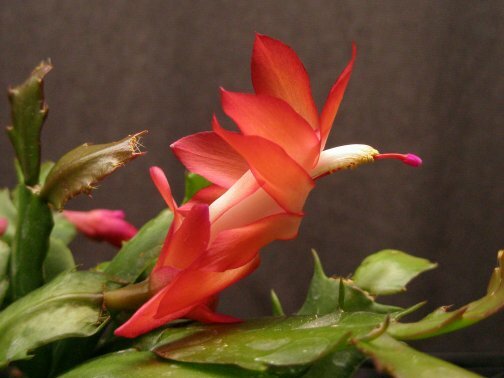 (Again, my memory is kinda vague here, but I believe the original Christmas cactus bloomed only in red/red-orange.) I'm sure you can investigate the subject online and find the most current thinking on the topic. Actually I have checked in from time to time, just couldn't think of anything to say... I know odd for me! It has been a very difficult year for me, including, I lost all of my house plants due to a fire in the master bedroom, where I also got burned, and couldn't use my hands for months. Smothering a fire does not always work like it should... sometimes, it flames quickly and you have to just drop the item.... not fast enough for me. And that is just a few of the issues I've been through this year. So, I am starting over collecting my African Violets and cacti. I test germinated my garden seed, and they survived the fire okay. It was the heat and smoke that killed my cacti and violets... and my chihuahua. My hands are pretty much back to normal, just a bit touchy where it was broken, the burns all healed really well. I'm sorry to hear that you've had such a run of bad luck! I hate to say it, but it sounds like some of the experiences I've had recently. No fires in my place yet, thank goodness. I broke my right hand back in February, and about 3 weeks ago I fell and broke my left hand. Both times I had marvelous road rash and bruises on my knees, too. I'm glad to hear you're recuperating well, though, and I wish you the best with your new plants.